The accessory nerve is the eleventh paired cranial nerve. 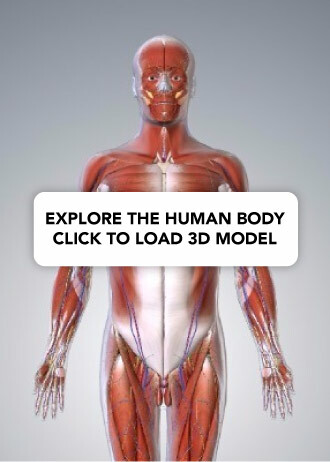 It has a purely somatic motor function, innervating the sternocleidomastoid and trapezius muscles. In this article, the anatomical course, motor functions and clinical relevance of the nerve will be examined. Traditionally, the accessory nerve is divided into spinal and cranial parts. Fig 1.0 – Extracranial course of the accessory nerve. The spinal portion arises from neurones of the upper spinal cord, specifically C1-C5/C6 spinal nerve roots. These fibres coalesce to form the spinal part of the accessory nerve, which then runs superiorly to enter the cranial cavity via the foramen magnum. The nerve traverses the posterior cranial fossa to reach the jugular foramen. It briefly meets the cranial portion of the accessory nerve, before exiting the skull (along with the glossopharyngeal and vagus nerves). Outside the cranium, the spinal part descends along the internal carotid artery to reach the sternocleidomastoid muscle, which it innervates. 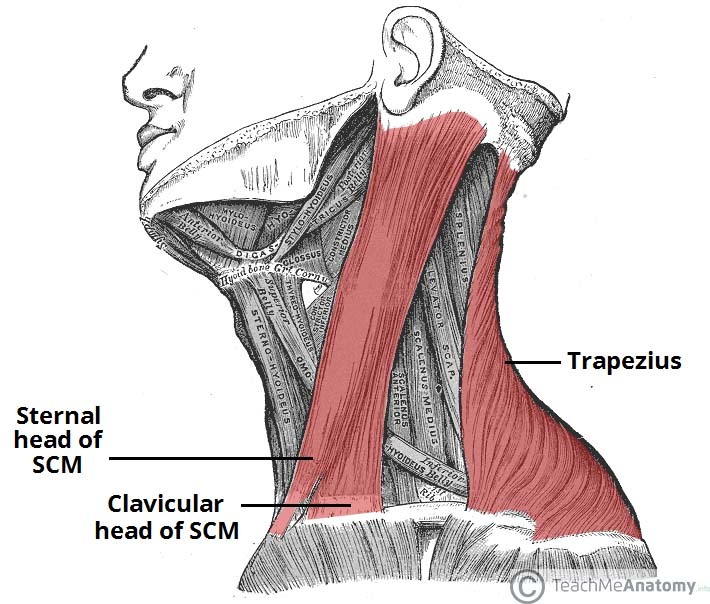 It then moves across the posterior triangle of the neck to supply motor fibres to the trapezius. Note: The extracranial course of the accessory nerve is relatively superficial (it runs between the investing and prevertebral layers of fascia), and thus leaves it vulnerable to damage. The cranial portion is much smaller, and arises from the lateral aspect of the medulla oblongata. It leaves the cranium via the jugular foramen, where it briefly contacts the spinal part of the accessory nerve. 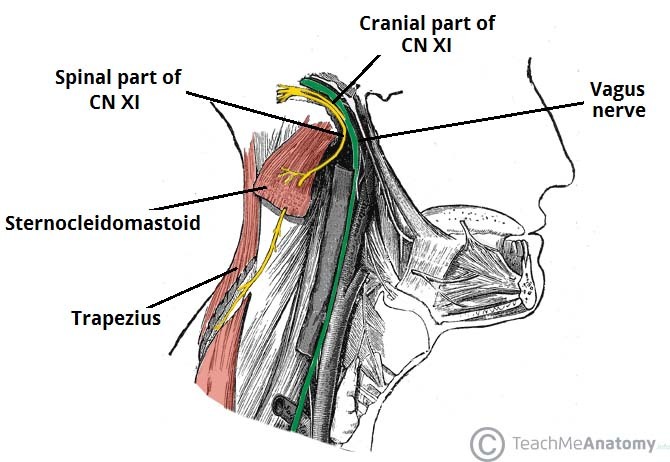 Immediately after leaving the skull, cranial part combines with the vagus nerve (CN X) at the inferior ganglion of vagus nerve (a ganglion is a collection of nerve cell bodies). The fibres from the cranial part are then distributed through the vagus nerve. For this reason, the cranial part of the accessory nerve is considered as part of the vagus nerve. The spinal accessory nerve innervates two muscles – the sternocleidomastoid and trapezius. Fig 1.1 – Lateral view of the neck. Note the two heads of the sternocleidomastoid (SMC). Attachments – Runs from the mastoid process of the temporal bone to the manubrium (sternal head) and the medial third of the clavicle (clavicular head). Actions – Lateral flexion and rotation of the neck when acting unilaterally, and extension of the neck at the atlanto-occipital joints when acting bilaterally. Attachments – Runs from the base of the skull and the spinous processes of the C7-T12 vertebrae to lateral third of the clavicle and the acromion of the scapula. Actions – It is made up of upper, middle and lower fibres. The upper fibres of the trapezius elevate the scapula and rotate it during abduction of the arm. The middle fibres retract the scapula and the lower fibres pull the scapula inferiorly. The accessory nerve is examined by asking the patient to rotate their head and shrug their shoulders, both normally and against resistance. Simply observing the patient may also reveal signs of muscle wasting in the sternocleidomastoid and trapezius in cases of long-standing nerve damage. The most common cause of accessory nerve damage is iatrogenic (i.e. due to a medical procedure). In particular, operations such as cervical lymph node biopsy or cannulation of the internal jugular vein can cause trauma to the nerve. Clinical features include muscle wasting and partial paralysis of the sternocleidomastoid, resulting in the inability to rotate the head or weakness in shrugging the shoulders. Damage to the muscles may also result in an asymmetrical neckline. Through which structures do the spinal accessory nerve enter and exit the cranium respectively? Which vascular structure is closely associated with the extracranial part of the spinal accessory nerve? Which of these structures are innervated by the accessory nerve?